It's simple and relatively quick to spike a watermelon with vodka. Also known as a drunken watermelon, you'll simply place a bottle of vodka (or other liquor) into a whole watermelon and let it slowly seep into the fruit. When done, cut the melon like normal and enjoy eating your boozy summer treat! This easy project is fun for parties and takes less than a day to create, so it's much faster than making watermelon-infused vodka. Just be sure that to let your guests know that the watermelon slices have vodka in them so no one's surprised. Also, keep the kids away from this plate! Gather the ingredients and tools. Secure your watermelon on the table using towels or cloth napkins to keep it from rolling. Draw a circle on the top side of the watermelon with a marker. Make sure it is slightly larger than the widest part of the vodka bottle's neck. Cut around the circle with a large knife, digging deep into the melon's flesh. Remove this chunk of rind and flesh. Use a spoon to scoop out enough melon so the bottle's neck can fit inside the hole. You want to go deep, though you will also be able to gently push the bottle in further. 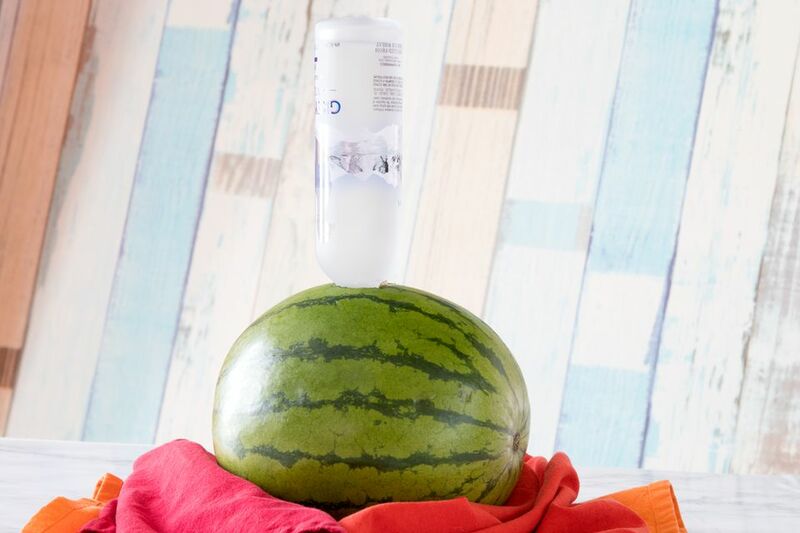 Open the bottle of vodka and quickly place it upside down in the hole of the watermelon. It should fit securely and be able to stabilize the bottle. Allow the vodka and melon to rest for 4 to 12 hours. The vodka will slowly filter into the watermelon's flesh as it rests. It may not use all of the vodka; the amount will depend on how juicy and large the melon is. When you're ready, quickly remove the vodka bottle. Be ready to use your finger or a towel as a stopper as you bring the bottle upright to prevent a big spill. Place your vodka-infused watermelon in the refrigerator to chill for at least a few hours. When you are ready to serve, simply cut the watermelon into slices as normal. Choose a vodka in a normal tall bottle (similar to Belvedere or Grey Goose). This technique requires balance and a long neck. Many of the fancier vodka bottles simply won't work. Wrapping the bottom of your watermelon with a large towel will prevent the melon from sliding around on the table while you work with it. It will also catch any spills. Want to make drunken watermelon in winter? No problem. Though it's a summer fruit, many markets import mini watermelon (about the size of a cantaloupe) to colder regions, especially after the first of the year. You will need to buy an appropriately sized vodka bottle, though; a half-pint (200ml) is about perfect. Choose a flavored vodka, such as citrus or berry, to add more flavor to your watermelon. If you prefer, switch to rum or tequila to spike your watermelon. Just keep in mind the preferred bottle shape; tequila, in particular, tends to be in stout, short neck bottles. You can transfer either into an empty vodka bottle with a funnel. The same technique can be used with other melons. Watermelon is often bigger, so it will take more vodka than cantaloupe or honeydew melon.